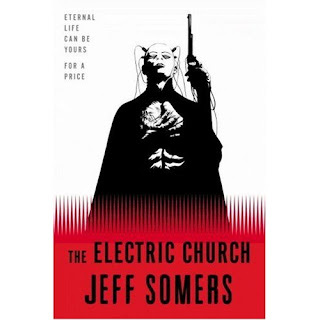 Yesterday I got the opportunity to scarf down a a book of the future - "The Electric Church" by Jeff Somers. It's actually not out 'till September 25th (I think that's correct) but I managed to obtain an advanced copy. Onc characterization is "Kill Bill meets Blade Runner" and that's fairly accurate. The book takes place in the not-too-distant future where yen is the currency of choice (a nice subtlety) and killing a man is akin to squashing a mosquito. Our hero, Avery Cates, becomes intertwined in a messy plot hindered by the SSP (cops you do not want to mess with) and the Monks, superficially a race of robots with human brains donated by those seeking eternal life to purge their sins. Although the setting is a bit tired, the novel injects enough originality and venom to make it captivating. Within the first 50 pages or so, the body count and number of expletives had already far outnumbered any I've encountered in another book, which of course renders this a must-read. If you're a sci-fi junkie like myself, I highly recommend it. The books is also part of an ARG, and it looks we've hit a roadblock without the book, which doesn't come out for ~21 weeks. Apparently there is a password on page 11 that needs to be used in game. Would you be able/willing to see if you can find it?